The beginning of baseball season is usually fairly hectic with roster moves. We find out which prospects made the Opening Day roster and what level others will start the season at. This season was especially crazy with the Padres promoting Chris Paddack and Fernando Tatis Jr while other prospects, like Eloy Jimenez and Brandon Lowe, signed extensions before the season started. Now that the dust has settled, we have plenty to talk about when it comes to prospects. And this is before the minor league season has even started. Paddack debuted, he pitched, he conquered. Are we really that surprised? I know I’m not. Paddack has dominated at every level of the minors en route to becoming one of the top pitching prospects in the game and a strong spring earned him a spot in the Padres rotation to start the season. Paddack made his MLB debut on Sunday, carving up the San Francisco Giants for five innings, allowing two hits, one earned run, and one walk while striking out seven. Out of his 79 pitches, 57 were thrown for strikes (72.2%). San Francisco hitters quickly learned that there’s not much you can do with a Chris Paddack changeup. Talk about nasty. That’s been the modus operandi for Paddack throughout his minor league career. He’ll feature a plus fastball in the low to mid-90’s with plenty of arm-side run and throws one of the best changeups in baseball with both fading and sinking action. When typing that last sentence, I accidentally typed “beast” instead of “best” which is very fitting as Paddack’s changeup truly is a beast of an offering. Throw in an ever-improving curveball and you have three legitimate weapons to make Major League hitters look silly with. 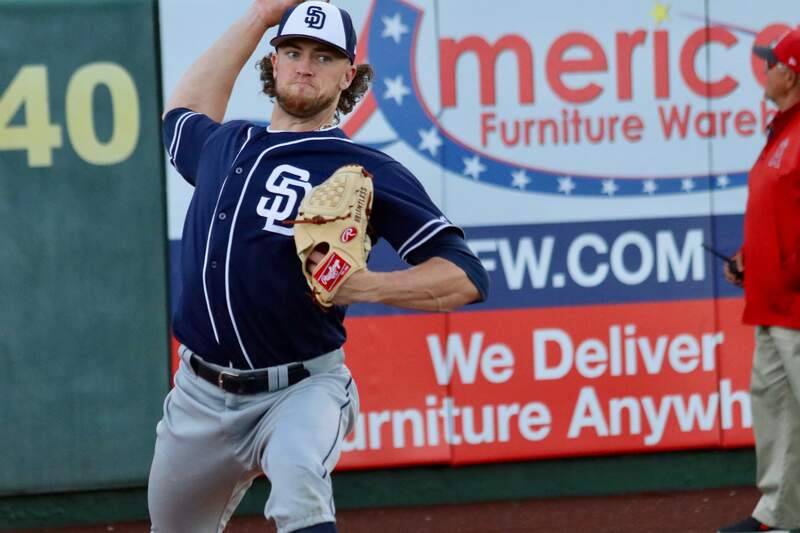 Yes, there will be some sort of an innings cap for the Padres’ prized arm, but Paddack has the upside to be a top-20 arm this season with low ratios and more than a strikeout per inning. 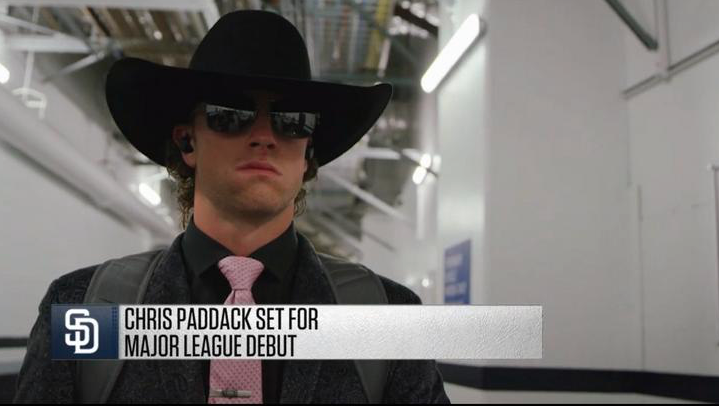 I now leave you with one more image of Chris Paddack showing that he’s a baller and shot caller, both on and off the field. In the least shocking news of the week (outside of Chris Paddack dominating), a hard-throwing top pitching prospect that had elbow issues last year is now undergoing Tommy John surgery. Didn’t see that one coming. Hunter Greene, the top pitching prospect in the Cincinnati Reds system and my No. 44 overall prospect will go under the knife next week, sidelining him for all of 2019 and likely part of the 2020 season as well. It’s a bummer, but not a surprise. Greene was shut down in late-July after suffering a UCL sprain in a start for Single-A Dayton on July 26th. After trying to rehab the elbow, Greene suffered a set back last week while warming up. Even with Greene out for the next season-plus, it’s not time to panic if you own him in dynasty leagues. The upside is still immensely high for Greene and he won’t even turn 20 until August. If anything, I might try to acquire him from a panicking dynasty owner. It’s no secret that Alex Kirilloff is one of the best pure hitters in the minors. But what he’s not quite as advance at is his defense in the outfield. He’s not a black hole out there or anything, but with him adding bulk to his frame and the plethora of other outfield prospects in this system, it makes sense to add a little flexibility here. Regardless of which spot his defensive home is, Kirilloff possesses the offensive skills to become one of the top bats at any position, capable of hitting north of .300 with 30-plus homers as a middle of the order force. If anything, this helps Kirilloff as there’s a clear path to first base in Minnesota. He’s the type of prospect you make room for regardless, but this added flexibility sure does make things easier on all. Kirilloff is also dealing with a minor wrist ailment and will open the season on the Disabled Injured list. Once ready to return to action, Kirilloff will report to Double-A Pensacola in the Southern League. We’re four games into Pete Alonso’s career and the mashing first baseman is on a four-game hitting streak. In those four games, Alonso is 7/17 with three doubles and an absolute missile for his first Major League home run. I’ve been pumping up Alonso all spring for 2019 re-draft leagues and this hot start gives me that warm and fuzzy feeling. There will be some bumps along the way like there are for all rookies, but Alonso is already one of the top power bats in the game with a realistic shot at 35 dingers this season. Not all MLB debuts can be as rosy as Mr. Alonso’s. After signing a six-year, $43 million contract extension, service time BS went out the window and Jimenez made the White Sox opening day roster, as he should’ve. To open his Major League career, Jimenez is just 2/15 with no extra-base hits and six strikeouts to just one walk. The upside here is a little higher than it is with Alonso due to the better contact skills so it should only be a matter of time before Eloy begins imposing his will. Thank you AJ Preller. The Padres wanted their best 25 players on their Opening Day roster and that meant Fernando Tatis Jr. starting at shortstop. He’s yet to light the world on fire, but Tatis has recorded hits in four of six games, adding a homer and a steal in 22 at-bats. Tatis is still barely 20 years old with 408 combined at-bats above A ball, so plenty of peaks and valleys should be expected. But at the end of the day, Tatis carries considerable upside in 2019 thanks to his power/speed. Don’t be surprised if he flirts with top-10 SS status by season’s end. With various injuries and Touki Toussaint being optioned to Triple-A, Kyle Wright made his first MLB start over the weekend, allowing two hits, three earned runs, and five walks in 4.1 innings or work. When you add in his relief appearances from late last season, Wright has now walked 11 batters in 10.1 innings. His inconsistent command has caused me to rank him lower than most and gives me pause in 2019. Wright has a bright future ahead of him, but I don’t expect his 2019 impact to be that big. Once the Braves get Kevin Gausman and/or Mike Foltynewicz back fro injury, Wright will likely head back to Triple-A. You can echo most of what I said for Wright here with Wilson. Making his first start of the season and the second of his career, Wilson was a tad wild against the Phillies on Saturday, walking four in 3.1 innings and throwing only 55% of his pitches for strikes. Like with Wright, the future is bright for Wilson, but he’s likely back in Triple-A by the end of the month. A starting pitching prospect’s MLB debut ended with him recording a three-inning save. Can’t say that every day. The Diamondbacks pitching hasn’t exactly been great to start the season, so it makes sense to give Duplantier a shot to see what he can do at the Major League level. Unless there’s an injury to a starter, Duplantier is likely only going to be used in relief for now, but should be the first name called if the need arises in the rotation. There’s No. 2/3 starter upside here and Duplantier would be a borderline mixed-league option if he moves into the D-Backs rotation this season. Due to a strained rotator cuff in his throwing shoulder, the Athletics opted to shut their prized southpaw down for four-to-six weeks. Luzardo was a candidate for a rotation spot before the shutdown and should enter the rotation at some point during the first half of the season. Once that happens, Luzardo has the upside to be a mixed league factor the rest of the way. While losing a prospect like Jo Adell for 10-12 weeks isn’t ideal, we’re lucky it wasn’t 10-12 months. That’s what it initially looked like when he slipped on a base back in spring training spraining his left ankle and straining his right hamstring. Hopefully, we should have Adell back in action by June or so. Fingers crossed. Man, Senzel just can’t catch a break. The Reds gave Senzel some time in the outfield due to the presence of Eugenio Suarez at the hot corner, and it looked like Senzel was going to take over early on in the season after getting more work in at Triple-A. But of course, he sprains his ankle and will likely be out until the end of April. Once he does return, Senzel will need some additional outfield seasoning in Triple-A, but should be up sometime in the first half of the season. Perez will begin the season on the IL and will likely miss all of April due to shoulder tendinitis. Rodriguez has the tools to hit for both power and a high average while adding double-digit speed in as well. As of now, he was barely outside my top-100 overall prospects, but if he continues progressing the way I believe he can, there’s top-25 overall potential as soon as my 2020 spring prospect ranking update. The Single-A assignment to the Sally is a good challenge for J-Rod and it will be interesting to see if he can rise to the occasion. I believe he can. He’s one of the prospects I’ll be watching the closest this season. This spot will highlight some top prospect performances and trends throughout the season. This will begin next week. HM: Logan Allen, Colin Poche, and Durbin Feltman.